VATICAN CITY, Rome -- The Ukrainian Greek Catholic Church is not a patriarchate, but it would like to be. A request for a recognition of patriarchal status recently came from Major Archbishop Sviatoslav Shevchuk, who addressed it in a speech delivered Feb. 9 for the 125th anniversary of the birth of Cardinal Josip Sliyi. The Ukrainian Greek Catholic Church is a church sui iuris, which means it is an autonomous Church with its specific rite, but in communion with Rome and subject to the governance of the Pope. Usually, Churches sui iuris are established as patriarchates. This means that they are led by a patriarch, elected by their synod, or leadership council of bishops. The Pope is informed of the election of the Patriarch, after which he grants ecclesiastical communio to the Patriarch. The Greek Ukrainian Catholic Church is instead a major archepiscopate. This means that, after the synod elects the major archbishop, the Pope must confirm the election to make it valid. Cardinal Slipyi was the first head of the Ukrainian Greek Catholic Church to be denoted a Major Archbishop. The situation was well explained in a speech by Archbishop Cyril Vasil, secretary of the Congregation for the Eastern Churches. In a lecture delivered at the Pontificio Istituto Orientale in February 2017, Archbishop Vasil reminded that “during the Second Vatican Council’s preparations, considered was made to give the status of patriarchate to the Ukrainian, Malabarese and Ethiopic Churches. He also noted that the Ukrainian Greek Catholic Church has “more than any other” sought to be recognized as Patriarchate. Major Archbishop Shevchuk’s request need to be framed by this background. Major Archbishop Shevchuk mentioned three different documents to support the request for a recognition as a patriarchate. The most important of these documents is a letter sent by then metropolitan Josip Slipyi to Bl. Paul VI. The letter is dated Aug. 19, 1963, and requests the pope recognize the Greek Catholic Patriarchate. The second document is a letter sent by the Greek Catholic Bishops taking part to the Second Vatican Council. And the third document is a letter by Cardinal Lubomyr Husar, the Major Archbishop’s predecessor as head of the Ukrainian Greek Catholic Church. Cardinal Husar stressed that the Ukrainian Greek Catholic Church have “all the rights and the signs of a Patriarchal Church,” and underscored that “the final goal is the flourishing life of the Church of Kiev. 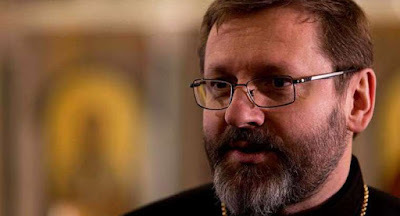 Cardinal Husar also listed five reasons why the possible establishment of a Patriarchate of the Ukrainian Greek Catholic Church is always rejected. The reasons mentioned were that the Patriarchate could weaken its link with Rome; that the Patriarchate could generate a nationalist Church and division with the other confessions; that the Patriarchate might be an obstacle to the union of Christians in Ukraine; that a Greek Catholic Patriarchate would threaten the Orthodox Moscow Patriarchate that considers Ukraine as its own territory; that the Patriarchate would be a ‘revival’ of the notion of uniate Church, already condemned as a wrong path to reach out for unity. The head of the Ukrainian Greek Catholic Church also debunked these five reasons. He maintained that these objections show a lack of understanding of the role of the Pope as a universal bishop.